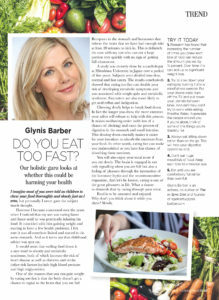 Diet & Nutrition Do you eat too fast? Did you know that eating too fast can make you gain weight? Slowing it all down will help you digest your food properly, increase your enjoyment of food and could help you slim down. I certainly was but never gave the subject much thought. However I became concerned over the years when I noticed that my son was eating faster and faster until he was practically inhaling his food. It coincided with him gaining weight and starting to have a few health problems. I felt sure it was all somehow linked and started to do some research. And as it turns out that childhood advice was spot on. It can also cause metabolic syndrome and both of these can increase the risk of heart disease as well as diabetes and stroke (other risk factors include high blood pressure and high triglycerides). One of the reasons that you can gain weight by eating too fast is that the body doesn’t get a chance to signal to the brain that you are full. Receptors in the stomach and hormones that inform the brain that we have had enough take at least 20 minutes to kick in. This is definitely the case with my son who can eat a large portion very quickly with no sign of getting full whatsoever. A study was recently done by a cardiologist at Hiroshima University in Japan over a period of five years. Subjects were divided into slow, normal and fast eaters. 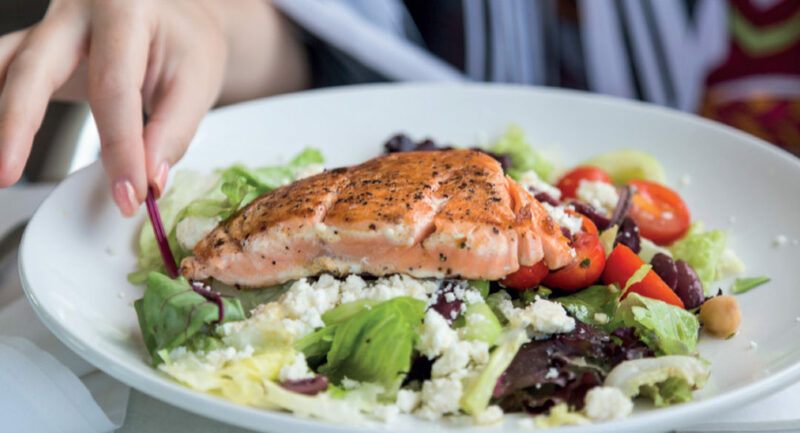 The results conclusively showed that eating too fast can double your risk of developing metabolic symptoms and was associated with weight gain and metabolic syndrome. Fast eaters are also more likely to get acid reflux and indigestion. In fact the longer you chew, the more enzymes your saliva will release to help with this process. It makes swallowing easier (with less of a chance of choking) and eases the process of digestion in the stomach and small intestine. This slowing down crucially makes it easier for your intestines to absorb the nutrients from your food. In other words, eating fast can make you malnourished as you have less chance of absorbing these nutrients. You will also enjoy your meal more if you eat slowly. The brain is engaged in not only signalling when you are full but also a feeling of pleasure through the interaction of the hormone leptin and the neurotransmitter dopamine. What a shame to diminish that by racing through your meal. Food is to be savoured and enjoyed. Why don’t you think about it while you chew? Slowly. Research has found that increasing the number of times you chew each bite of food can reduce the amount you eat by 15 percent. Over time this can add up to significant weight loss. Try to slow down your eating by turning it into a mindfulness exercise. Put your phone aside, turn off the TV and put down your utensils between bit And definitely don’t try to work while eating. Breathe. Relax. Appreciate the people around you. If you’re alone, think of some of the things you’re thankful for. Don’t eat huge mouthfuls of food. Keep each bite to a modest size. Eat until you are comfortably full rather than over-full.